From a small corporate event with a countryside twist to an intimate family gathering, Cherrytrees is the perfect spot for a special lunch or dinner for up to 50 people.The atmosphere is informal yet sophisticated, and guests can be seated either in the Victorian conservatory, or on the terrace in the Walled Garden. Whether you are celebrating a special birthday, anniversary or corporate event, or holding a funeral gathering, Cherrytrees provides a beautiful and secluded setting. The garden and conservatory have also been used for fashion and wedding photoshoots, and the walled space is lovely for classical music! We welcome your ideas – please get in touch to discuss. Family celebrations, birthdays, anniversaries or corporate events – Cherrytrees offers a magical setting and a relaxed, friendly welcome. We can cater for up to 50 people for lunch or dinner, with the garden looking its fabulous best in the daytime. 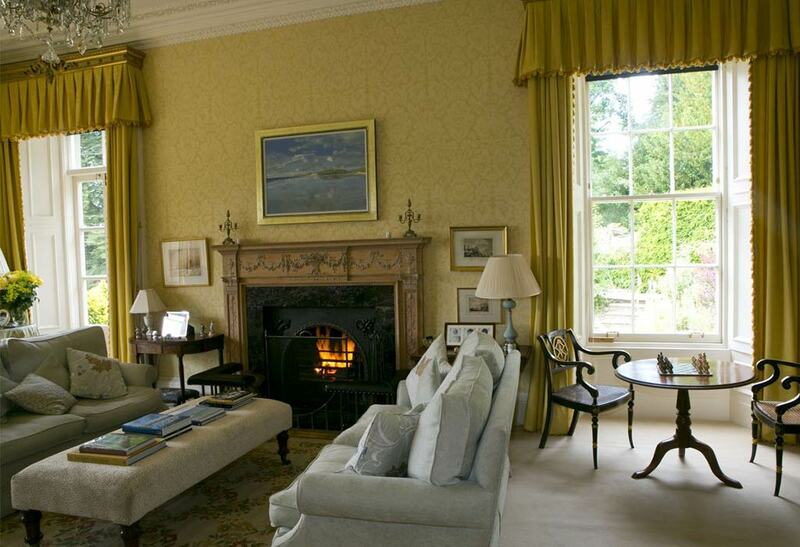 The Drawing Room and Dining Room at Cherrytrees House are also available for special dinners or lunches. Guests coming from far afield can stay at a wide range of local hotel, B&B or self-catering accommodation. The Walled Garden at Cherrytrees has a wonderfully peaceful atmosphere, and offers a lovely setting for gathering with friends and family after a funeral. The abundance of flowers and birdsong can be uplifting, and visitors may find the sense of seclusion and serenity a comfort. Cut flowers can also be provided from the garden if available and in season. If you're looking for a relaxed venue for your corporate event, business meeting or group gathering, Cherrytrees offers several options. 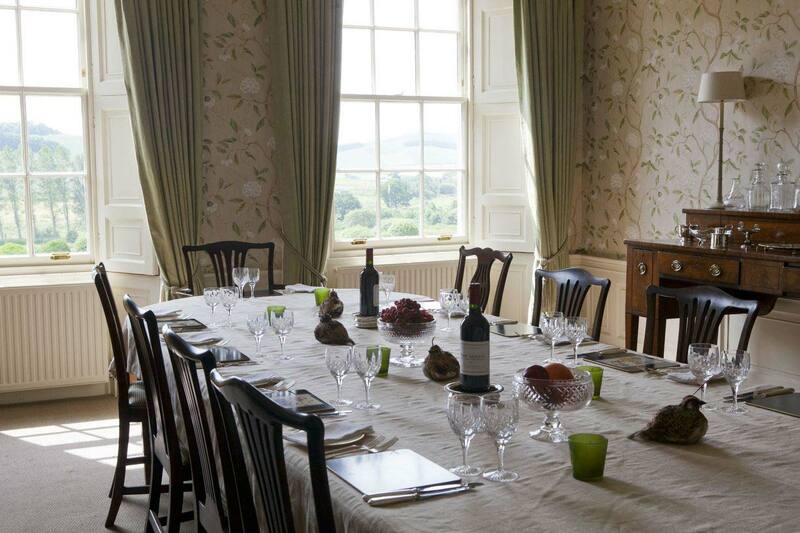 Guests can use the main house Dining Room with its large table for business meetings, while the Drawing Room is ideal for informal gatherings such as sporting parties or reunions. The Victorian conservatory in the Walled Garden also makes an inspiring meeting-place, and can hold a seated lunch or dinner for up to 38 people. Free WiFi is also available in the house. Get in touch to discuss your group’s needs. Cherrytrees House and garden have been used as a photoshoot location for fashion and weddings at all times of the year, including bridal fashion spreads for Scottish Weddings magazine and an award-winning fashion shoot for prestigious Borders cashmere company Scott & Charters. There are lots of beautiful spots in and around Cherrytrees, including the south-facing Victorian conservatory and Walled Garden with its interesting ironwork, stone urn and glorious flowers throughout the year, the sculptural yews in the parkland, and the fantastic views across to the wild Cheviots. The Dining Room and Drawing Room in Cherrytrees House are also south-facing and bright, with lovely views from the windows. Get inspired by Cherrytrees at its most glamorous, and contact us for more information!